Oliver Queen’s dashing facial hair isn’t the only big return for him in the just released GREEN ARROW VOL. 1: THE DEATH AND LIFE OF OLIVER QUEEN—his utterly hopeless (and sometimes completely embarrassing) devotion to one Dinah Lance, aka the Black Canary is back too, and the two of them are well on their way to reclaiming their status as one of the DC Universe’s most iconic power couples. Theirs is a romance shaped over decades and across the Multiverse, but like most matters of the heart, it hasn’t always been easy or simple. The ravages of time, reinvention and crises (both cosmic and moral) have made Ollie and Dinah’s love story read more like a super heroic soap opera than a Romeo and Juliet tale—which, if you ask me, is pretty befitting of a modern day Robin Hood and a rock star. So, to celebrate the long awaited reunion of Green Arrow and Black Canary, let's take a closer look into their topsy-turvy history and uncover just what makes the two of them so iconic. Both Ollie and Dinah had some...well, odd beginnings. Both of them were created in the heart of the Golden Age with Ollie’s first publication happening in 1941 and Dinah’s coming six years later in 1947. Like most Golden Age heroes, their earliest forms didn’t really resemble the heroes we know and love today. Sure, Ollie was still a green-clad archer and Dinah’s biker jacket-and-fishnets look was mostly there, but that’s where the similarities end. To complicate matters even further, this early incarnation of Dinah was located on Earth-2, while Ollie was a citizen of Earth-1. Something that obviously posed a bit of a problem as far as interaction between the two of them was concerned. Luckily, meetings between the two Earths weren’t totally unheard of and by 1963, the Justice Society of Earth-2 and the Justice League of Earth-1 had their very first team up in the pages of JUSTICE LEAGUE OF AMERICA #21. I wish I could say that sparks flew right away, but the truth is it resulted in what amounted to a missed connection. While both Ollie and Dinah occupied the same universe and, theoretically became aware of one another during the event, the two didn’t share a scene. That, unfortunately, would take another six years when in 1969 (in JUSTICE LEAGUE OF AMERICA #74, above) the JSA and the JLA were made to fight one another. Here, the first real interaction between Ollie and Dinah went just about as well as you might expect—that is to say, pretty poorly. And kind of violently. Paired off during the fight, Ollie was forced to incapacitate Black Canary with a trick arrow. Not necessarily a meet-cute worthy of a rom com, but better than nothing. The events of Justice League of America #74 also resulted in the death of Dinah’s Golden Age husband, a Gotham City cop by the name of Larry Lance. The tragedy inspired Dinah to leave Earth-2 behind wholesale, and make the permanent move over to Earth-1 where she eventually joined up with the Justice League—a decision that made her the first Golden Age hero to be an official member of both the JLA and the JSA. That same month, in the pages of THE BRAVE AND THE BOLD #85, Ollie also goes through a pretty radical change of status quo when he’s given a complete overhaul and redesign. Finally, the Emerald Archer looks a little more recognizable to modern eyes, complete with his trademark goatee and form fitting tunic. By 1970, Ollie and Dinah’s romance was really beginning to take form as Dinah became a regular feature of Ollie’s adventures in ACTION COMICS, DETECTIVE COMICS, and the famous GREEN LANTERN/GREEN ARROW: HARD TRAVELING HEROES run. In fact, it’s in GREEN LANTERN/GREEN ARROW #78 that the two share their first on-panel kiss—an event that prompts a sweep of flashbacks that establish retroactively that Ollie and Dinah have, in fact, been a couple for quite some time, maybe even as far back as Dinah’s original move to Earth-1. With their relationship confirmed, Dinah becomes a fixture of Ollie’s stories across any book they make take place in. What’s more, she slowly becomes a much needed counterpoint to Ollie’s well intentioned, but often wildly misguided, political activism. When Ollie’s former kid sidekick, Roy Harper, reveals that he’s become addicted to heroin, it’s Dinah who steps in to help him while Ollie violently shuns him. When Ollie starts to doubt her—or any other woman’s—ability to care and defend themselves, she’s the first person to put him back in his place. Their relationship would continue to be a critical part of both their lives and stories for years, even through the continuity altering events of CRISIS ON INFINITE EARTHS and the formative GREEN ARROW: THE LONGBOW HUNTERS which took their relationship even further when it showed Ollie asking Dinah to marry him. ...She refuses, however, on the grounds that their vigilante lifestyle wasn’t really conducive to a healthy family life. Brutal as that truth may be, she definitely had a point. However, like most good things, they just couldn’t last. In 1995, after nearly 25 years together, Oliver Queen was killed off in GREEN ARROW #101. And to make things even worse, Ollie and Dinah were actually broken up at the time, after Dinah mistakenly believed Ollie to have cheated on her. It would be six years before Ollie was brought back from the dead in a complex and cosmic maneuver from his good friend Hal Jordan in Kevin Smith’s 2001 GREEN ARROW: QUIVER story arc. Despite the unresolved bad blood from their last encounter, their reunion is a sweet one. While Dinah doesn’t completely forgive Ollie for everything he’s put her through, she’s mostly just happy to hear his voice again. But, as you might imagine, coming back from the dead after such a long time away is...well, pretty challenging. So, tearful reunions notwithstanding, the couple soon found themselves on the outs once more just three years later, after GREEN ARROW #40 in 2003. This particular break up lasted around three years before the two of them reconnected in 2007’s GREEN ARROW #75, just in time for Ollie to make his second marriage proposal. And wouldn’t you know it? This one stuck. Don’t worry basically their entire wedding party had the exact same doubts that are probably popping up in your head right about now. Their wedding—which was of course interrupted by super-villains—kicked off their first official joint series, GREEN ARROW AND BLACK CANARY, and a relatively happy marriage. At least until Ollie found himself in jail after murdering a super-villain named Prometheus in 2010. This particular parting of ways actually lasted until...well, now. The couple stayed completely separate until GREEN ARROW: REBIRTH #1, which represents the first reconnection for Ollie and Dinah in 5 years—a pretty long time spent apart, to be sure, but not the longest or the worst thing they’ve ever bounced back from. The fact is this: Despite their wild ups, downs, reunions and departures, both Ollie and Dinah have grown over the years into forces that balance one another out. With nearly 50 years of shared history, they’ve sunk into one another’s bones. 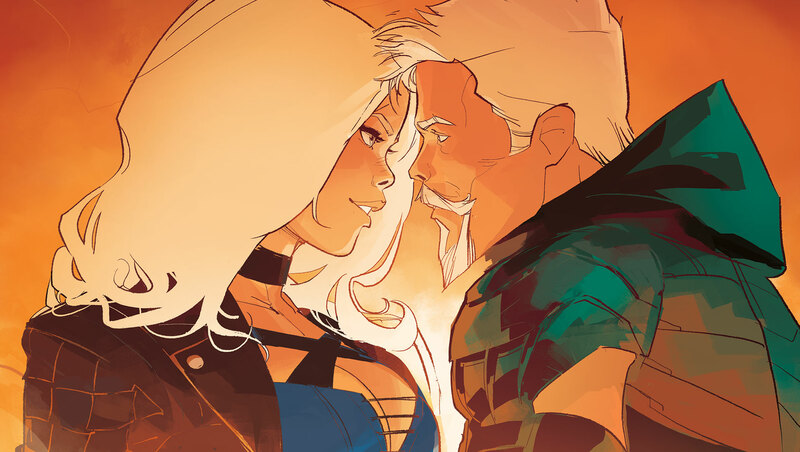 You can catch the latest installment of Ollie and Dinah’s super heroic, operatic, timeless romance more easily than ever now that the first Green Arrow Rebirth collection is on shelves now!